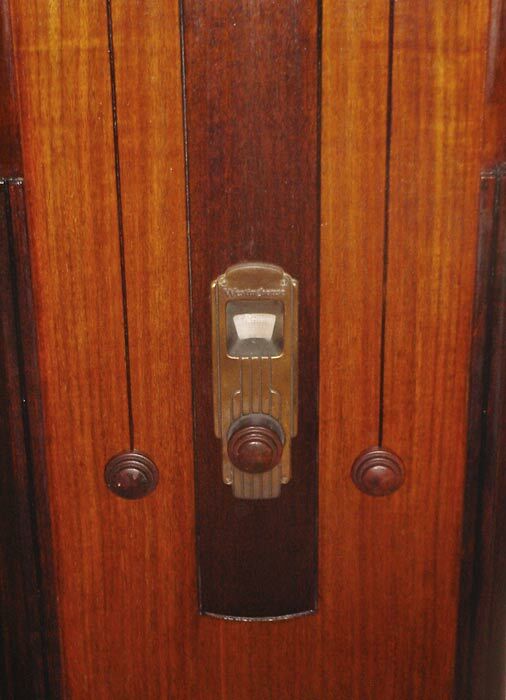 Westinghouse WR15 "Columaire Jr Deluxe"
The radio is identical to the RCA R-11 for schematic and technical information. 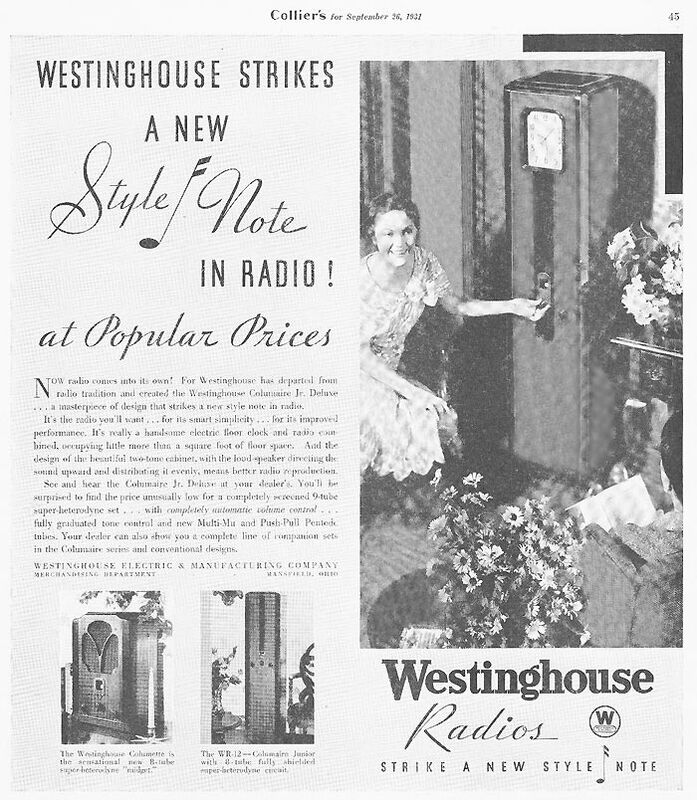 The radio was an early superheterodyne and Westinghouse advertised it with "completely automatic volume control," an emphasis on the then novel AVC circuit that used an dedicated 27 tube in the design. A pair of 47 tubes were used for the final push pull audio amplifier stage. The WR15 originally sold for $125 complete with tubes. I purchased the radio locally in 2015 from a couple who had originally bought it in an estate sale in Wisconsin a decade ago and brought it down to Austin, Texas where it sat in an attic since then. 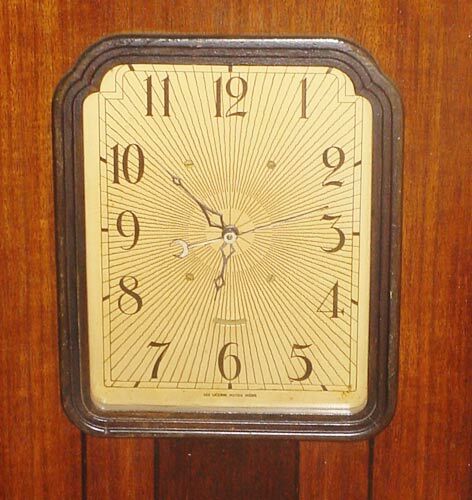 The original finish was long gone due to its past storage conditions. I stripped and refinished the cabinet with special walnut everywhere except the center and corner trim pieces were stained with dark walnut. 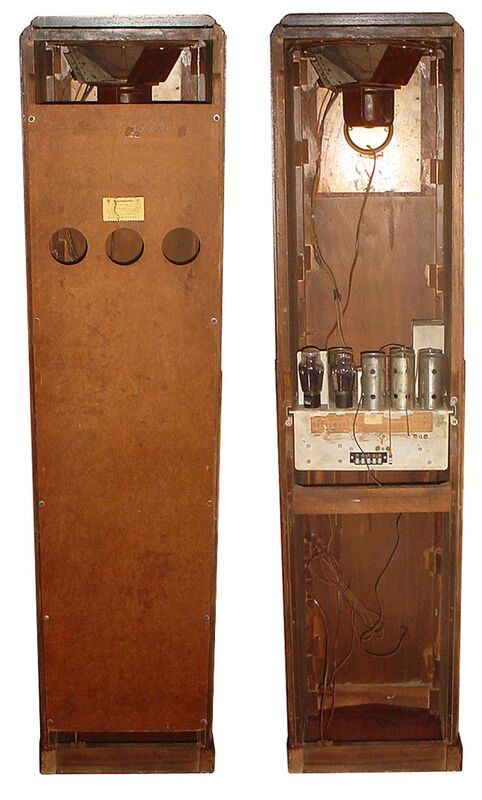 In the radio, many of the paper capacitors including B+ filters were encased in a large tar filled metal box and most were still functional. The B+ filter capacitors however did not last very long because they developed shorts and pulled down the B+ rail from the nominal 240V to 100V. Disconnecting these capacitors in the block and soldering in place new filter capacitors resolved the problem and the radio worked very well afterwards. The only other problem I encountered was a rubber friction bushing used between the tuning knob shaft and the dial that had disintegrated. I replaced it with a new rubber test tube stopper of similar diameter by cutting it to the correct height and drilling through the center, although there do exist stoppers with a center hole already. On one final note, the clock mechanism in my example was replaced with a newer mechanism at some point in its life and is not the original mechanism.